For sale we have this unique accessory the black tungsten diamond dog tag pendant with bead chain. 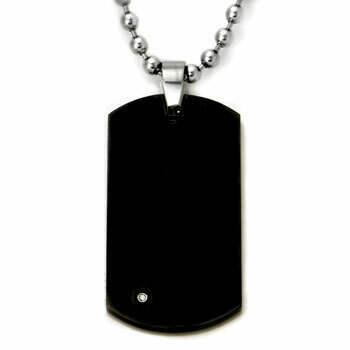 Made of the black tungsten which is a TitaniumKay.com jewelry industry exclusive, the dog tag measures 1.75 inches long and 1 inch wide, and features a 0.01 total carat weight round brilliant diamond with clarity S11 and color grade G/H. Tungsten is a lustrous and silvery white metal which we have found the method to turn it black. The bulk metal resists attack by oxygen, acids and alkalis as such this makes the ring resistant to corrosion so it will last a lifetime. Designed after the military identification tags issued to soldiers our black tungsten diamond dog tag pendant with bead chain is the perfect accessory for anyone who likes the dog tag look in jewelry. This item comes with a free stainless steel military style bead necklace chain. I purchased this dog tag for my husband and he loved it. Its one of the best looking tungsten dog tags I've seen. And it looks great with the diamond in it. I also got laser engraving on the back and they called me and verified everything with me and it turned out perfect. Thank you titanium kay. My husband loves it.